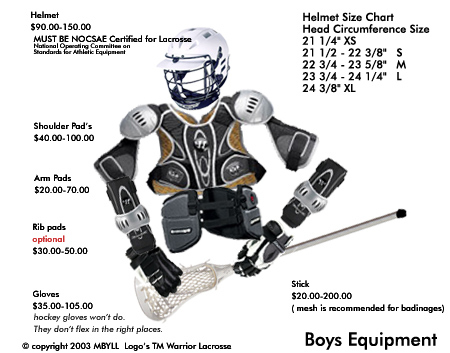 game rules to equipment needs for your son. The Stick buying guide link below will help in understanding the basics. U9 allows for all players to have a minimum stick length of 37.5", including the head. U11 allows for all players to have a stick length of 40"-42", including the head. U13 & U15 allows for Attack-man and Middies to have a stick length of 40"-42", including the head. U13 allows for Defensivemen to have a stick length between 40"- 60", including the head. U15 allows for Defensivemen to have a stick length between 40" - 72", including the head. U13 & U15 allows for Goalies to have a stick length of 40"-72", including the head". It is an important element of the game to learn to protect your stick while cradling the ball. Obviously if the stick is too short, it could ultimately hinder an athletes development. If the stick is too long for the athlete, it will be very frustrating and could discourage him from the sport of lacrosse.